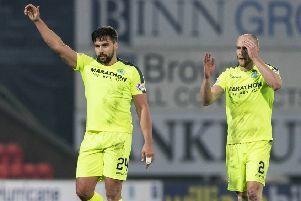 Alan Stubbs believes Hibs will emerge as one of the strongest clubs in Scotland if owner Sir Tom Farmer can arrange a deal to wipe out their debt. Kwik-Fit supremo Farmer is currently negotiating with bankers to try to clear the club’s debt – believed to be around £8 million – with full details of the developments due to be revealed at next month’s AGM. Stubbs is confident a bright future awaits his club. “It’s brilliant news, the fact that we’ve got the opportunity of potentially wiping the whole of the debt clear,” said the head coach. “We’re very, very lucky we’ve got an owner who is prepared to do that and, looking from the outside in, I think everybody should be really optimistic about what the next step could be for the club. The next step from my point of view is trying to get the team back into the Premiership. Hibs have invested heavily in modern training facilities at East Mains and developing Easter Road into one of the finest stadia in the country, but any satisfaction over such ventures has been soured in the eyes of supporters by the club’s on-field underachievement. Stubbs said: “We’ve got a fantastic set-up and it’s the envy of most people, but it hasn’t necessarily been used the right way. We feel as if we’ve got a structure in place where we’re going to benefit from it; maybe not me because the benefits might come in three, four, five years’ time.